Learn about the highest-performing robust wall insulation for where space is at a premium, such as in big cities. Sam Proctor of Proctor Group contacted me 2008/05/15 having seen my mention of the Spacetherm product here on Earth Notes. He is in charge of Spacetherm development. He offered to chat to me about existing and upcoming products. None of the manufacturing is environmentally unpleasant as he explained it. In particular, by being able to avoid blowing agents used in other products, there are no harmful leaks/emissions of these agents possible. Thus there is no ensuing degradation in insulation performance over time. Spacetherm should be good for 50 years without loss of performance, I am told. The embodied energy is less than most insulation alternatives other than wool. Sam Proctor told me (as of 2013/03/26) that Proctor Group ships very roughly 30,000m^2 of aerogel per year. 2400x1200 is too fragile under its own weight: 1200x1200 would be better. Too dusty: needs a PVA coat or three before plastering. Delaminates when cutting, with the Fermacell especially prone to separating from the foil vapour-control layer. Difficult to handle so very slow compared to Celotex/Kingspan, and more material waste/breakage. Some responses in an eBuild.co.uk thread. The product that Proctor brands in the UK as Spacetherm is originally Aspen Aerogel's Space Loft. Other firms use brands such as Spaceline and Magnaline. The reason that the aerogel sometimes grabs the drill bit is because the polyester reinforcing in the insulation melts at high temperature. So once the drill bit gets hot it sticks to the bit. The secret is to drill the holes ... quickly avoiding the bit overheating too much. Use a new bit, set the drill on hammer if necessary, and go at it with some gusto pulling the bit out as soon as possible. In theory one type of insulation that can beat aerogel on performance, ie the amount of insulation value per unit thickness, is "VIP" or Vacuum Insulated Panel. You may well have VIPs already in your fridge/freezer. A VIP is a rigid air-tight unit with all the gas pumped out, thus a vacuum inside. 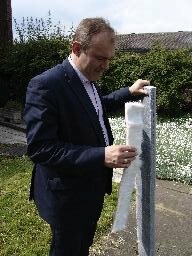 The unit may contain aerogel or glass fibre to help resist the inward air pressure. A vacuum more or less eliminates heat transfer by conduction and convection for example. Radiation can be mitigated with reflective surfaces, as with a vacuum flask. 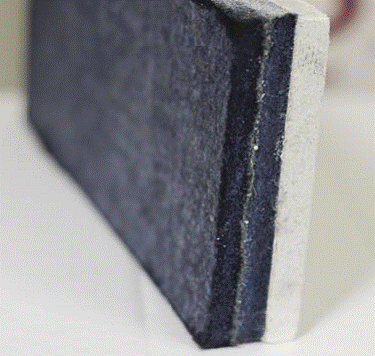 Aerogel is therefore likely the best robust and workable wall insulation! Aerogel Spaceloft full ETA (European Technical Approval) #11/0471. The BBA has been designated by the UK Government to issue European Technical Approvals (ETAs) and to represent the UK in the European Organisation for Technical Approvals (EOTA). 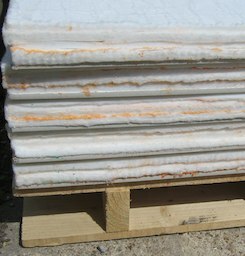 Spacetherm aerogel insulation from Proctor. "The aerogel insulation used in the Spacetherm boards has a k-factor of 0.013, this compares to around 0.023 for most types of polyurethane/polyisocyanurate boards, and around 0.030 for extruded polystyrene." 2012/04/29: David Jordan used strips of aerogel blanket from some of my off-cuts behind his hot water pipes: "I needed to pull the pipes away from the wall, hence the orange straps". The new floor with 9mm Spacetherm is 1C warmer than vinyl+ply+floorboards, 1-2C warmer than just floorboards. All in unheated rooms. I've re-installed radiators today so I'm looking forward to seeing what [difference] it makes in a heated room. Note that Cabot has an aerogel range called NanoGel(TM) for, for example, light-transmissive but high-R/low-U heat insulative building applications. Discussion of internal/external insulation, aerogels, foams, and the UK housing stock. 1 tog seems to be an R value of 0.1 m^2K/W or a U-factor of 10W/m^2/K. Online U-value calculator c/o The Energy Management Register. 2011/08/11: Energy Saving Trust: Insulation materials chart — thermal properties and environmental ratings. 2012/11/24: Spacetherm-P 40mm at £176/m^2 from The Passivhaus Store Unit 6, Coombe Park, Ashprington, Totnes, Devon, TQ9 7DY, 0345 257 1540. First published 2008-05-15 , updated 2019-04-17 , rebuilt 2019-04-19 . Site copyright © 2007-2019 Damon Hart-Davis. Hosted by ExNet.